A 17-year-old boy was in custody Wednesday after leading deputies on a pursuit through Vista, then refusing to exit his pickup truck and later taking off on foot and trying to hide, authorities said Wednesday. Photo via OnScene.TV. A 17-year-old boy was in custody Wednesday after leading deputies on a pursuit through Vista, then refusing to exit his pickup truck and later taking off on foot and trying to hide, authorities said Wednesday. 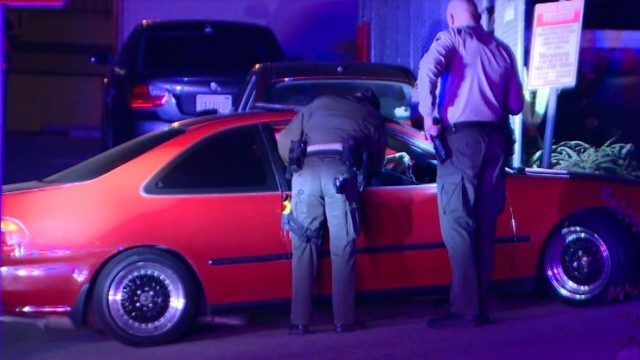 A deputy was patrolling near the intersection of East Vista Way and Townsite Drive around 11 p.m. Tuesday when he spotted two “suspicious vehicles” in the area and attempted to pull over the truck, San Diego County sheriff’s Lt. Jack Reynolds said. The driver took off, triggering the chase, during which the deputy noticed the second vehicle was following him and called for air support and additional units, the lieutenant said. A short time later, both vehicles stopped near the intersection of Palm Drive and Stadden Way, around a half-mile from where the chase began, Reynolds said. The driver of the second vehicle complied with deputies’ orders and was detained for further questioning, Reynolds said, adding that the motorist was eventually released without being booked. The pickup driver, meanwhile, refused orders to get out of the truck and surrender. “After numerous orders to exit the vehicle, deputies used a bean bag shotgun to break out one of the windows so they could deploy pepper ball rounds into the vehicle,” Reynolds said. The teen then fled and hid nearby, the lieutenant said. The sheriff’s helicopter crew directed deputies to where the boy was holed up, but he still refused to comply with deputies’ orders, prompting them to fire bean bag rounds to get him into custody, Reynolds said. The youth, whose name was withheld because he is a minor, was taken to Tri-City Hospital for treatment of minor injuries, then booked into Juvenile Hall on suspicion of felony evasion, the lieutenant said.